Free State province of South Africa. According to the Mid-year population estimates, 2017, there were over 2,8 million people in the Free State on about 129 825 km2 of land. The main languages spoken are Sesotho, Afrikaans and isiXhosa. The Free State has wide horizons and blue skies, farmland, mountains, goldfields and widely dispersed towns. It lies in the heart of South Africa, with Lesotho nestling in the hollow of its bean-like shape. Between the Vaal River in the north and the Orange River in the south, this immense rolling prairie stretches as far as the eye can see. The Free State sprawls over high plains and stretching along the Maluti Mountains bordering Lesotho. Near the sandstone cliffs and Basotho Cultural Village of Golden Gate Highlands National Park is Clarens, a town distinguished by its art galleries. The Anglo-Boer War Museum in South Africa’s judicial capital of Bloemfontein traces the Free State’s history as a Boer republic. Mangaung, comprising Bloemfontein, Botshabelo and Thaba Nchu, has an established institutional, educational and administrative infrastructure. With Bloemfontein being South Africa’s judicial capital, the province houses the Supreme Court of Appeal. Important towns include Welkom, Sasolburg, Odendaalsrus, Kroonstad, Parys, Phuthaditjhaba, Bethlehem and the charming village of Clarens situated in the rolling foothills of the Maluti Mountains. Some of South Africa’s most valued San rock art can be found in the Free State. Other tourist attractions include the Golden Gate National Park, the annual air show in Bethlehem, the Cherry Festival in Ficksburg and the Fauresmith International Endurance Ride equestrian event. The annual Mangaung African Cultural Festival, known as Macufe, is hosted in partnership with the Tourism Authority and the Performing Arts Centre of the Free State. The Vredefort Dome, 10 km in diameter, is South Africa’s seventh World Heritage Site. For information on Free State Towns/Cities please Click HERE. 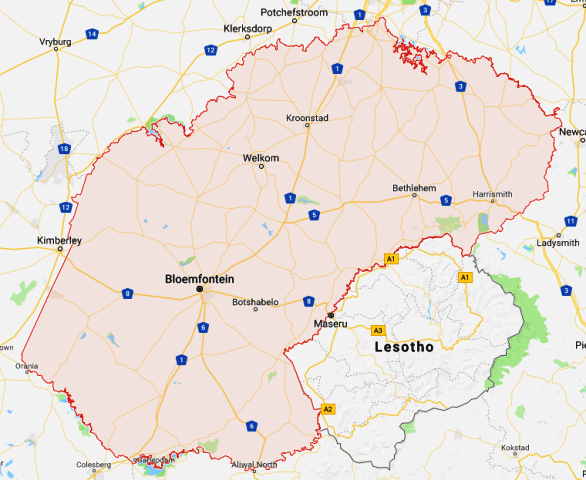 Although the Free State is the third-largest province in South Africa, it has the second-smallest population and the second-lowest population density. The economy is dominated by agriculture, mining and manufacturing. Known as the ‘bread basket’ of South Africa, about 90% of the province is under cultivation for crop production. It produces approximately 34% of the total maize production of South Africa, 37% of wheat, 53% of sorghum, 33% of potatoes, 18% of red meat, 30% of groundnuts and 15% of wool. The province is the world’s fifth-largest gold producer, with mining the major employer. It is a leader in the chemicals industry, being home to the giant synthetic-fuels company, Sasol. Agriculture dominates the Free State landscape, with cultivated land covering 32 000 km2 and natural veld and grazing 87 000 km2 of the province. Field crops yield almost two thirds of the gross agricultural income of the province. Animal products contribute a further 30%, with the balance generated by horticulture. The National Development Plan has intensified the mining potential that still exists in the goldfields region of Matjhabeng in the Lejweleputswa District as a job intervention zone. The De Bron-Merriespruit Gold Project and the Bloemhoek Gold Project are included as potential development projects in the scope of work of the Presidential Infrastructure Coordinating Commission. The province has 12 gold mines, producing 30% of South Africa’s output and making it the fifth-largest producer of gold in the world. Gold mines in the Free State also supply a substantial portion of the total silver produced in the country. Uranium occurring in the gold-bearing conglomerates of the goldfields is extracted as a by-product. The Free State’s gold reef of more than 400 km stretches across the province from Gauteng. South Africa’s largest goldmining complex is Free State Consolidated Goldfields, with an area of 330 km2. Bituminous coal is mined and converted to petrochemicals at Sasolburg. The province also produces high-quality diamonds from its kimberlite pipes and fissures, and the country’s largest deposit of bentonite is found in the Koppies district. The Maluti-a-Phofung Special Economic Zone is the Free State’s share of the logistics and industrial corridor. The Vehicle Distribution Centre was established in partnership with the German Bremen Logistics Group, which committed R60 million towards this project. The Harrismith Food Processing Park forms part of the broader development initiative. The green economic solar zone in the Xhariep district was expected to result in the establishment of the Xhariep Solar Park, harnessing the solar radiation in the southern part of the Free State. The Ingula Pumped Storage Scheme forms part of Eskom’s capital expansion programme. This energy infrastructure project is located on the border of the Phumelela and Maluti-a-Phofung Local Municipalities in the Free State and eMnambithi Local Municipality and the uThukela District Municipality in KwaZuluNatal. Sasol South Africa, the largest producer of synthetic fuels on the sub-continent, remains a key role-player in the Free State economy. Its investment in its Sasolburg operations is evident from the Wax Expansion project, the Ethylene Purification Unit 5, the Gas Engine Power Plant and Clean Fuels 2. The Omnia Nitric Acid complex, located within the Sasol Industrial Complex, includes a nitric acid plant, an ammonium nitrate plant, a porous ammonium nitrate plant, a fleet of 145 specialised ammonia rail tankers and other ancillary facilities. The Cheetah Route takes you through the Mangaung District – the cultural and political heart of the Free State. Abundant historical, cultural and natural attractions make the region a top business and recreational destination. Following the Free State’s southern border with Lesotho, the Eagle route runs from Ficksburg to Harrismith through some of the most picturesque landscape in the country. Activity highlights include cherry picking, seeing dinosaur fossils and rock paintings, arts & craft shopping, skiing in the winter slopes, horse riding and 4X4 trips. Visit the Free State Tourism page HERE for more information. • Is a cultural jewel of the Free State. • Located about 14 km’s from the Golden Gate Hotel. • The rest camp has two and four sleeper self–catering rondavels with stunning views of the mountains. The Golden Gate Highlands National Park and approximately 80 provincial, municipal and privately owned nature parks, nature reserves, game reserves, game farms, etc. The Free State National Botanical Garden in Bloemfontein spans over 70 ha and is home to approximately 400 species of plants mainly from the Free State, Northern Cape and Lesotho. Furthermore, approximately 124 species of birds and 54 species of reptiles inhabit the garden. Dramatic mountainscapes, huge bodies of water that lend themselves to recreation, spectacular national parks, World Heritage Sites, and wide open spaces — the Free State has all of this, and then some. As South Africa’s most centrally located province, the Free State is easy to get to and it has shown a growing ability and desire to host big events. For information on Free State Golf Courses please visit this PAGE for contact details and brief summaries of some of the Gold Courses around the Free State. The current state and shape of Free State’s economy clearly presents huge opportunities for investors in the manufacturing sector. The Free State Development Corporation (FDC) is actively searching for investors, and giving them a helping hand, as in the construction of factories in the Harrismith and Botshabelo areas. The opening of a Makro store in Bloemfontein, and extensions being carried out on other retail malls, indicate that a recovery in the provincial economy is under way. Massive investments by companies in the oil and gas and petrochemical sector in Sasolburg have also boosted the economy. In agriprocessing, a number of opportunities exist in the province. Some products that are being explored are cherries, asparagus, vegetables, wholesale meat, leather and increased seed production in the province’s eastern reaches. Tourism is another sector that is being targeted as the province seeks to diversify its economy away from an over-dependence on agriculture and mining. With its King’s Park Rose Garden containing more than 4 000 rose bushes, the Free State’s major city, Bloemfontein, has rightfully earned the nickname “City of Roses”. The city also hosts an annual rose festival. Groundnuts are grown mainly in the Free State, North West and Northern Cape. The normal planting time for groundnuts is mid October to mid-November. Sunflower seed is produced in the Free State, North West, the Mpumalanga Highveld and in Limpopo. During the 2016 production season, the bulk of the crop was produced in the Free State (55,7%), North West (34.1%) and Limpopo (9,1%). The Mangaung Metropolitan Municipality is a metropolitan municipality which governs Bloemfontein and surrounding towns in the Free State province of South Africa. Mangaung is a Sesotho name meaning “place of Cheetahs”. On 8 January 2012, Africa’s oldest liberation movement, the ANC, celebrated 100 years of existence. This was a historic achievement, not only for the movement, but also for South Africa, the continent and the world. Thousands of ordinary South Africans, political and religious leaders attended the centenary celebrations which were held in Mangaung, Free State, the birthplace of the ANC. In its early years, the ANC was concerned mainly with constitutional protest. Worker militancy emerged in the wake of the First World War and continued through the 1920s. It included strikes and an anti-pass campaign, given impetus by women, particularly in the Free State, resisting the extension of the pass laws to them. The Free State province produced 48,0% (17 000 t) of the 2015/16 commercial crop. The leading dry bean producer in South Africa. The 1914 Rebellion started in Memel three and a half years after the establishment of the Union of South Africa. In 1914, when war broke out between Britain and Germany, the South African government’s announcement that also was going to invade German South West Africa (today’s Namibia), fighting broke out between former Generals of the Anglo-Boer War and government forces. The Vredefort Structurein the Vredefort/Parys area has been declared South Africa’s 7th International World Heritage Site and is recognized worldwide as the oldest and biggest meteorite impact site. The primary purpose of a Humanities education is to give you access to critical thinking skills, appreciation of literature, understanding of cultures, the uses of power, the mysteries of the mind, the organisation of societies, the complexities of leadership, the art of communication, and the challenge of change. All of these skills will support you in your future careers. A qualification in the Humanities is therefore well respected all over the world, and people with this type of qualification form the backbone of society.